1957 Cissy wearing a blue satin sheath dress with matching overskirt. The ensemble includes a dramatic open crown and triple layered pink tulle hat. The 1950s fashion silhouette came in basic three looks. The first was Dior’s classic “New Look,” featuring a tailored bodice, nipped in waist and full skirt. The second look was boxier and is best explained by the "sweater set" that included a sweater, and a straight skirt. The cardigan sweater was ideal for this silhouette. The cardigan/skirt boxy combination would be adopted by Chanel to become the basic silhouette for Chanel even today. The third look was a similar, but much sleeker sheath dress version. The 50’s sheath often had a scoop or boat neckline, often decorated with little collars or bows. The skirt of the dress was what we refer to today as a “pencil” silhouette. This skirt was fitted and frequently tapered down to the mid-calf. A variation to the sheath added an overskirt that became one of the iconic looks of the period. There was the immensely popular overskirt over a sheath dress. The overskirt was also adopted for cocktail and evening wear. There as a category for the newest rage for home entertainment. Part dress, part Capri pants. The 1950s hostess gown was a large circle skirt with an opening down the front revealing slim fitting Capri or cigarette pants underneath. 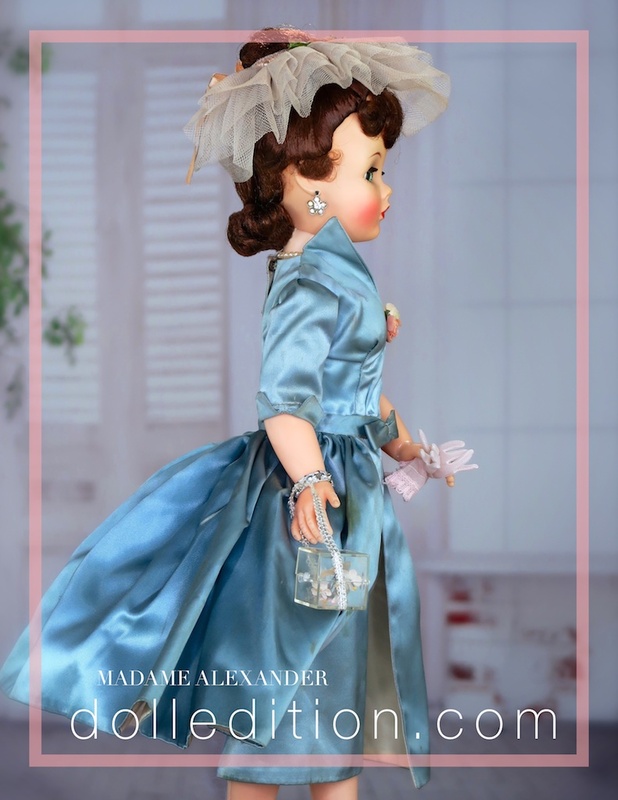 Being the fashion doll that she was, Cissy, of course, had a sheath dress or two in her designs from Madame Alexander. This 1957 satin sheath and overskirt is the most familiar. There is also the 1958 black velvet sheath dress No. 2231 that has become known as "Matinee Cissy." 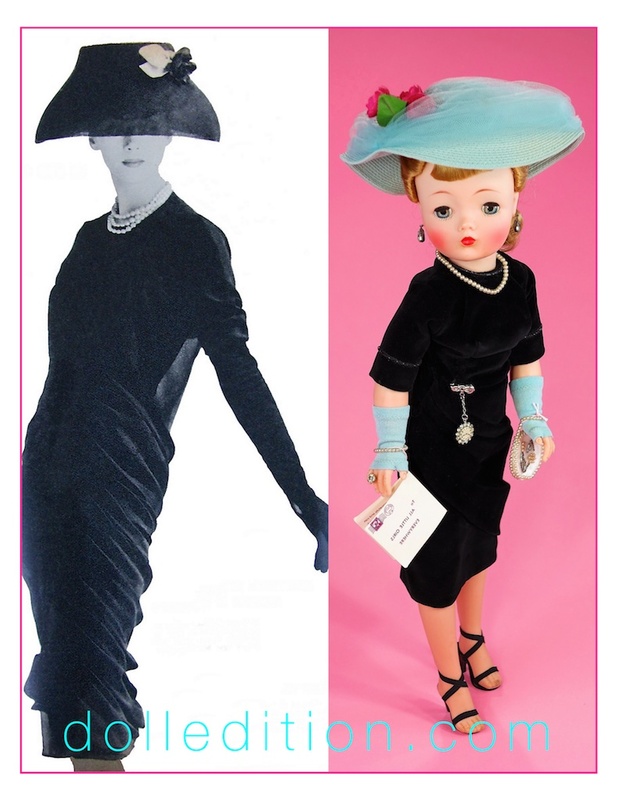 The sheath was often paired with large hats that five it this iconic image of fashion that became part of television, the movie screen, advertising, and the runway. The doll is one of a few that came with the side spit-curl as part of her wig design. While the satin sheath dress and overskirt might be the more familiar sheath dress for Cissy, there is also the No. 2231 1958 "Matinee" Cissy that can be seen as a reflection of the 1957 Givenchy version. Cissy got spit curls to go with the satin sheath with overskirt. This doll also came with the flower motif rhinestone earrings.